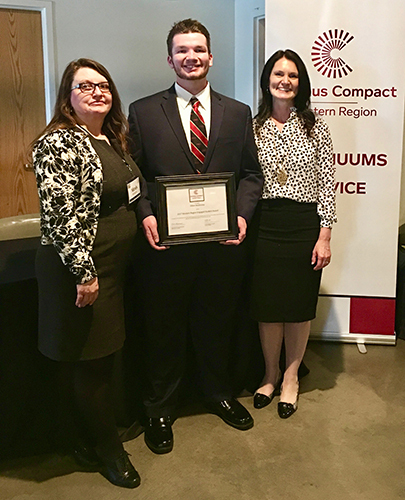 Dixie State University Student Association Vice President of Service Dillon McKinney was recently honored with the 2017 Community Engaged Student Leadership Award by the Western Region of Campus Compact. For McKinney, who admits to being caught off guard when he found out that he won the award, providing service opportunities for the Dixie State community is a team effort. Having been heavily involved with the service branch since its inception in 2014, McKinney has served as the student association’s vice president of service for two years and is preparing to enter his third year during the 2017-18 academic year. During the 2015-16 school year, McKinney and his service branch provided 44 service events and led the campus in contributing more than 5,000 service hours to causes such as national hunger and homelessness. The DSUSA Service branch also heads the Campus to Community service project every semester in which students are encouraged to engage with the community. Dixie State partners with United Way Dixie on projects such as packaging 100,000 meals for the community’s underfed and helping the area’s nonprofit agencies with various tasks and projects. Additionally, during his first year with DSUSA, McKinney helped develop and implement DSU’s first Alternative Spring Break in which students forgo traditional beach vacations in favor of service trips. Now expanded to also include regional trips over fall break, the program holds a special place in McKinney’s heart, as it offers him and his participating peers the opportunity to serve in new and different capacities. McKinney also has been instrumental in motivating statewide service efforts across all Utah Campus Compact member institutions as co-chair of Utah Campus Compact’s Student Advisory Council. Campus Compact, a coalition of colleges and universities, deepens institutions’ abilities to improve community life and educate students in civic and social responsibility. The coalition encourages students to become engaged in their communities by promoting civic responsibility, service, collaboration, inclusiveness and flexibility. To learn more about Dixie State University Student Association’s service efforts, visit thedixielife.com/service.